Firefighters are battling a massive blaze at the French capital's iconic Notre-Dame Cathedral, where flames and black smoke were seen shooting from the base of the medieval church's spire on Monday. The fire chief in Paris says it's unclear if city firefighters will be able to save Notre-Dame Cathedral. 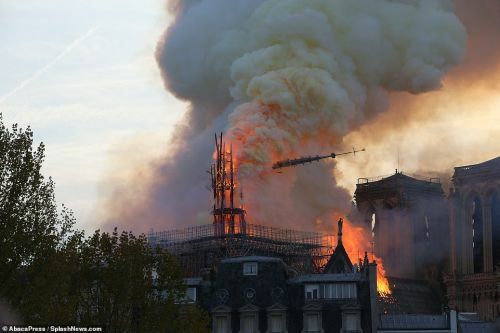 The spire of the historic Notre-Dame Cathedral has collapsed as the wooden structure supporting the roof was ravaged by the blaze. Flames have spread to one of the cathedral's two towers. The 12th century cathedral was in the midst of a massive 20-year renovation project. Due to the fire, President Emmanuel Macron has postponed a highly-anticipated TV address on the Yellow Vest crisis, and rushed to the scene. Deputy Paris mayor Emmanuel Gregoire said that workers are scrambling "to save all the artworks that can be saved". A tragedy for Western Civilization. This page contains a single entry by DaveH published on April 15, 2019 1:33 PM. Break for lunch was the previous entry in this blog. Now this is very very cool - welding 7075 is the next entry in this blog.